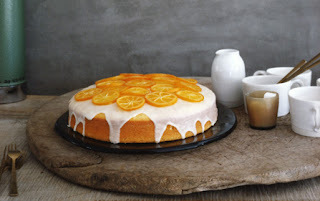 AMY, this is the Meyer Lemon Cake I mentioned to you. It takes a while to make but it is so worth it. Melt butter in saucepan. Cool and set aside. In a mixing bowl, using an electric mixer, beat egg yolks with 1 cup of the sugar until thick and light in color, about 2 to 3 minutes. Beat in buttermilk, Meyer lemon juice and zest. Sift together cake flour, baking powder and salt. In a separate bowl, beat egg whites with an electric mixer until they hold soft peaks. Then add the remaining ¼ cup of sugar and continue beating until stiff peaks form. Fold half the flour mixture into egg-yolk mixture, followed by half the egg white mixture—so you don't deflate the batter. Repeat with remaining flour and egg white mixtures. Take about 1 cup of the batter and stir it into melted butter. Gently fold butter mixture into the rest of the cake batter. Pour into a buttered and floured 9-inch cake pan or Bundt pan, and bake for about 50 to 60 minutes until cake is lightly brown and pulling slightly away from the edge of the pan. While cake is baking, make glaze and candied Meyer lemon slices. For glaze, combine Meyer lemon juice and the confectioners' sugar in a saucepan. Heat, stirring occasionally, until sugar is dissolved. Set aside. For the candied slices, cut Meyer lemons widthwise, in ¼ inch slices, and discard end pieces. Remove seeds. In a saucepan, combine 2 cups of water with 2 cups of sugar. Bring to a gentle boil and simmer five minutes. Add lemon slices and simmer about five more minutes, until fruit is soft but not falling apart. With a slotted spoon, remove slices and place on waxed or parchment paper. When the cake is baked, cool in the pan for 5 minutes, and then invert onto a cooling rack. With a long toothpick, poke the top of the cake to make about two dozen small deep holes. Slowly spoon the warm glaze over the cake, allowing to sink in before adding more. Poke extra holes if needed, eventually using all the glaze. Arrange the candied lemon slices in a random pattern on top. Cool the cake completely and serve. This looks so good I want to make it right now!